"Brilliant!" 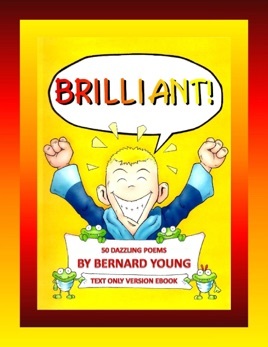 is a book of 50 dazzling poems for children by Bernard Young. The book was first published in hard copy in 2000 and is being released as an ebook in 2013. This version is text only without any illustrations. Bernard Young is a professional writer and performer who leads writing workshops for children and adults. He has given hundreds of performances in a variety of settings (from prisons to pubs, leisure centres to libraries, as well as colleges, schools, playgrounds and supermarkets!). Bernard’s poems have been broadcast on local and national radio and feature in numerous anthologies of poetry for young readers.